Stream your favorite Christian music from your iPhone or iPod to a pair of Bluetooh compatible speakers or headphones of your choice. All you need is the newest, smallest, slimmest & lightest Bluetooth stereo transmitter by Infinxx. With this Tiny “About 5 grams” adapter, you can enjoy Excellent High Quality Stereo Music from Both your iPhone 2G/3G, and iPod without using any wires! 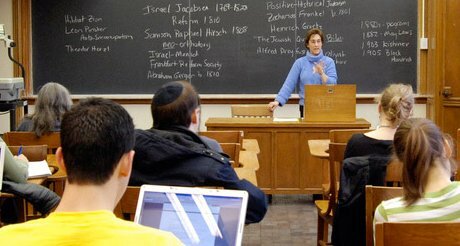 Yale University is offering FREE and open access to several introductory courses taught by distinguished teachers and scholars. The goal of the project is to expand access to educational materials for anyone who wishes to learn. Are you one of them? One of the courses being offered is the “Introduction to the Old Testament” (Hebrew Bible) with Professor Christine Hayes. The course examines the Old Testament (Hebrew Bible) as an expression of the religious life and thought of ancient Israel, and a foundational document of Western civilization. Special emphasis is placed on the Bible against the backdrop of its historical and cultural setting in the Ancient Near East. What is really nice is that you can read the class notes, listen to the lecture or watch it being taught right from own your computer. There are several colleges and universities that provide Free courses. For a complete list of all courses available visit the Free Online Courses from Great Universities site. Categories include: cultural studies, economics, geography, history, literature, philosophy, religion, and a whole bunch more. For more FREE Bible courses check out Free Christian Courses. Pretty cool technology don’t you think? 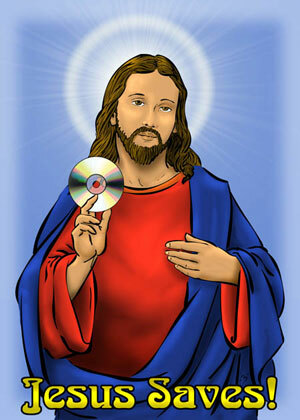 Jesus and Satan were having a discussion as to who is the better programmer. This goes on for a few hours until they come to an agreement to hold a contest, with God as the judge. They sit themselves at their computers and begin. They type furiously, lines of code streaming up the screen, for several hours straight. Hopefully this little bit of humor prompts you to save your files. Do you save? Don’t get caught in the same situation. Always save & backup your files, always. You do backup your files don’t you? Most likely you have a lot of important information in your computer (homework assignments, financial data, photos, music, church records, sermons, ministry files, outlook files, etc.) How would you feel if all of that info. was lost? If disaster strikes will you be ready? 1. Copy your files to a CD and send them to a friend. Even if you did use one of the above methods, one day you might forget to backup your stuff. I’d like to introduce you to the method I use to backup my files. 5. Mozy Online Backup. There are many online backup services, I use Mozy.com because it’s a simple, affordable and a fast way to safely backup all of my important files to a secure location. The best part is that it’s FREE (for up to 2 GB of data with no setup fee, no credit cards and no monthly payment). If you need more space it costs only $4.95 a month for an unlimited number of files. Mozy works for both PC’s and Mac’s. All you need is an internet connection. I recommend that you try out the free version first then upgrade to the paid version. For a full review of Mozy click here. For those who have questions about security, Mozy uses, 128-bit SSL encryption: The same technology used by banks secures your data during the backup process. Mozy also uses 448-bit Blowfish encryption: This secures your files while in storage, providing peace of mind that your private data is safe from hackers. Once you install Mozy on your computer you never have to worry about backing up your files again. It will backup all of your files everyday, automatically. Here’s what to do: Sign up for a free account, download and install the free software, select the files to backup and tell it what time you want it to backup your files. That’s it, Mozy does the rest. What’s nice about Mozy is that it will back up your documents whether they’re open or closed. Also, after the first backup, Mozy only backs up files that have been added or changed, making subsequent backups very fast. Check them out at Mozy.com and remember, Jesus Saves! Theology is the study God. One of the attributes of God is his love for people. According to the Bible, God is love (1 John 4:8). God’s love is indescribable. Here’s an inspiring example of the love between a father and son. To get the full impact of this video, read the following completely before viewing. A son asked his father, “Dad, will you take part in a marathon with me?” The father who, despite having a heart condition, says ‘Yes’. They went on to complete the marathon together. Father and son went on to join other marathons, the father always saying ‘Yes’ to his son’s request of going through the race together. One day, the son asked his father, ‘Dad, let’s join the Ironman together.’ To which, his father said ‘Yes’. For those who didn’t know, Ironman is the toughest triathlon ever. The race encompasses three endurance events of a 2.4 mile (3.86 kilometer) ocean swim, follow ed by a 112 mile (180.2 kilometer) bike ride, and ending with a 26.2 mile (42.195 kilometer) marathon along the coast of the Big Island Father and son went on to complete the race together. Click here or on the photo below to view the race. According to Barna Research the probability of accepting Christ is much greater among children, than by teens and adults. In children between the ages of 5 and 13 the probability of accepting Christ is 32%. It drops to 4% for those between the ages of 14 and 18, and picks up to only 6% for the rest of life. The ripest field is children! Kidology helps to equip and encourage those who minister to children. They do this through their website, and through providing practical training, creative teaching resources, and personal consultation. Kidology, in its simplest form, means “the study of kids.” In a broader sense it is a call to children’s ministers to approach ministry to children from within the context of the culture of children. As a missionary first learns the culture of the lost he hopes to reach the lost, the “Kidologist,” or student of “kidology,” seeks to first understand today’s kid and culture before attempting to reach them, so that they can be reached creatively and effectively.